The most famous mutiny in the world occurred in the Pacific Ocean in the spring of 1789. On 23 December 1787 HMS Bounty had set sail for Tahiti to collect breadfruit under the captaincy of Lieutenant William Bligh, aged 35. Ten months later, it docked at its destination, 43,000 km (26,718 mi) from home. The Bounty stayed for six months to allow the breadfruit to grow and become sturdy enough for the long voyage home. During that time the crew enjoyed the delights of fresh food, sunshine, beautiful scenery and local hospitality. When the Bounty sailed on 6 April the crew was not in a good mood. Bligh exacerbated their anger by accusing his friend and highly-strung first mate Fletcher Christian of being a “cowardly rascal” and stealing coconuts. Bligh had cut the crew’s rations and flogged crew members on the slightest pretext. Three weeks later the crew, led by Christian, mutinied. They burst into Bligh’s cabin and dragged him, clad in his nightshirt, onto the deck where he was tied to the mast. Eighteen members of the crew remained loyal to Bligh (four more were forced to stay behind because there was no room in the boat) and they sailed for six weeks and 5,823 km (3,618 mi) before landing at Timor and safety on 14 June 1789. Upon his return to England on 14 March 1790, Bligh was exonerated of any blame. In 1805 he was appointed Captain General and Governor of New South Wales at a salary of £2,000 a year. In February 1806 he sailed to Australia. He faced another mutiny – the so called Rum Rebellion – in New South Wales on 26 January 1808. He was found by the mutineers cowering under a feather bed in a back room of the gubernatorial mansion and was imprisoned until March 1810. Released, he sailed for London on 27 April 1810 where he died of cancer on 7 December 1817. The mutineers arrived at Pitcairn Island on 15 January 1790 where they burnt the Bounty. Soon tensions grew between the mutineers and the Tahitians they had taken with them. The Tahitians killed five of the mutineers, including Fletcher Christian. Another mutineer committed suicide in 1798. John Adams was the last mutineer to die, passing away in 1829. 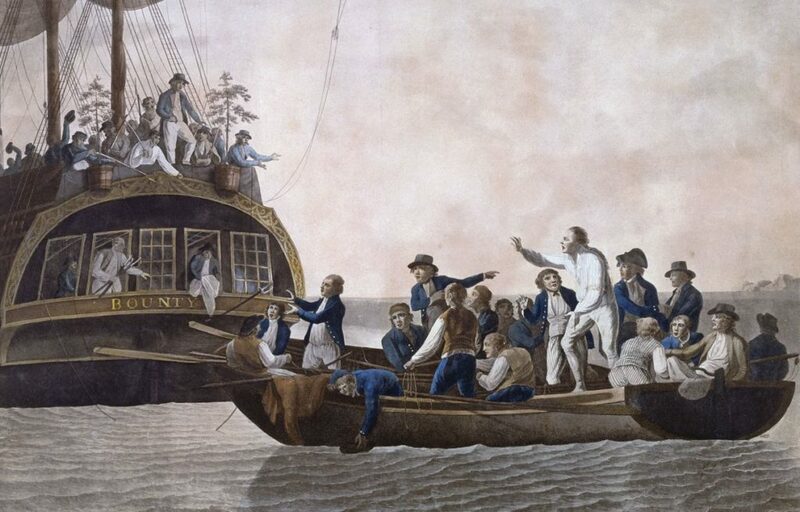 The Bounty’s captain was nicknamed “Breadfruit Bligh” because of the purpose of the voyage.